Cold and flu season is in full force around here! Thankfully, our family has been spared so far, but February’s Simply Earth essential oils recipe box has arrived, so we’re prepared should it strike. Essential oils have been around for a very long time, but Simply Earth has put a new spin on them, offering high quality, pure oils in a monthly subscription box. Each box also includes recipes and most of the necessary supplies for the recipes. Take a look at some of their previous boxes I’ve received..
All seven recipes in the February box required very minimal effort. They were basically all mix-and-go recipes, which is definitely handy if you aren’t feeling your best. I don’t think they would be necessary for the particular recipes in this box, but should you have any questions about completing a project, Simply Earth does have instructional videos for each box available on their web site. My favorite is the Head Soothing Roll-on. I put it to use immediately. If you follow me on Instagram, you may have seen that my second subscription box from Simply Earth finally arrived. We’re in the midst of moving (during the craziest holiday & birthday season is the best time to move ya know), and it took an extra week or so to track it down between the two houses and having mail forwarded, etc. I got it though! Each box contains 6-7 natural recipes, printed on cute little cards on a ring to keep you organized, 4-5 full size essential oils, and most of the necessary supplies for the craft recipes. Simply Earth gives back by donating 13% of their profits to organizations that aid in ending human trafficking and restoring the victims’ lives. The essential oils that arrived in this box were spearmint, coffee, ginger, and citrus burst. Also in this box was instructions and supplies for more holiday blends and a few crafts that would make good gifts. I enjoyed stretching my crafting muscles, which I admit have gotten pretty rusty over the last few years. I did much better with the second project, the “Digest Roll-on,” a roll-on blend of spearmint and ginger essential oils, said to ease digestion issues. I love that Simply Earth even included a pre-printed label for the roll-on bottle! I’m terrible about having to sniff and pour out my homemade household cleaners, mixes, etc. because I have no idea what’s in the bottle. The diffuser blend recipe this month is a new favorite of mine! Citrus Burst and Coffee! Who would have thought of that? Certainly not me, but I love it. I love to turn it on in the morning to wake myself up. Other recipes inside this box included a holiday scented body scrub, diffuser necklace (which is super cool and not nearly as difficult to make as I imagined. ), and a flannel hand warmer. Now that I’ve seen two boxes, I can honestly say I recommend Simply Earth! It’s an easy and fun introduction for an essential oils novice and a convenient way to expand your essential oils collection and knowledge for experienced users. 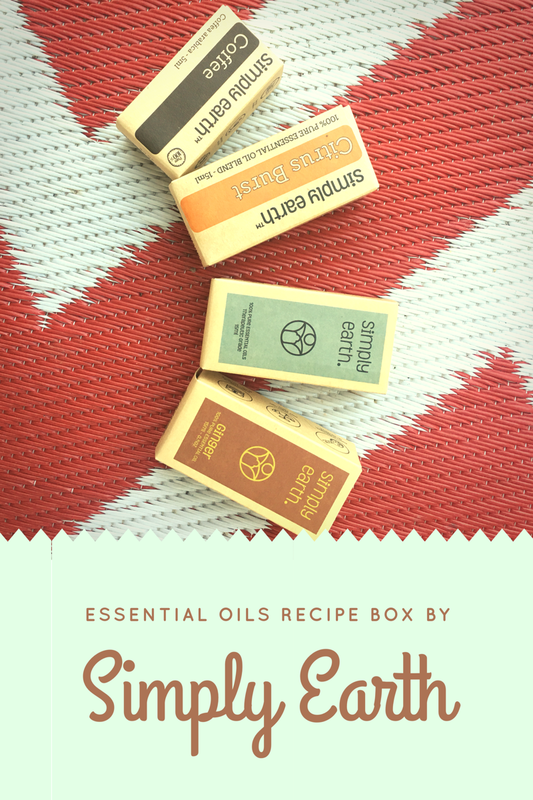 Simply Earth offers three options for the essential oils recipe boxes. Shipping is free, and you can pause or cancel a subscription at any time. Looking for a specific oil or a new diffuser? They have those too, and you can order oils and roll-ons individually.So head on over to SimplyEarth.com to get your subscription started, or even send one as a gift!